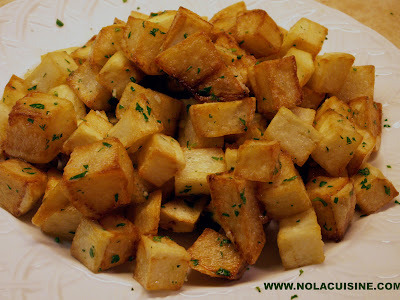 Peel the Potatoes and cut into 1/2″-3/4″ dice. Soak these in cold water for about 15-20 minutes. Drain the potatoes and wash under cold water, the object is to remove some of the starch. Drain and pat dry with paper towels, you want them very dry before they go into the oil. Heat the Oil to 360-375 degrees in a 2 qt saucepan. Deep fry the potatoes until golden brown, in batches, you don’t want to overcrowd the pan (see note). Drain on dry paper towels. Season with salt & black pepper. Place the drained potatoes on a warm serving plate(s). In a saute pan heat the Olive Oil over medium low heat and saute the garlic until fragrant, add the parsley and the butter, incorporating it in by constantly shaking the pan back and forth. Season the sauce with salt and pepper and pour over the potatoes, or toss them in it. Serve immediately. An easy way to keep the potatoes from sticking to pan or getting soggy if using the oven method, is to stick the pan in the oven when preheating. This way you have a nice hot pan to drop the potatoes on.